So school has started up again for both of us, and all of a sudden I can’t just spend hours cooking something cause it might make a delicious dinner. I don’t have a meal plan this year, so I have to think ahead and go on grocery trips and make sure I have leftovers to bring to work. Phew. Most of the stuff I’ve been cooking hasn’t been too exciting, but I’m going to post some links below to the kind of recipes I depend on– generally meatless, pretty much one-pot meals that make enough for six even though I’m only feeding one. 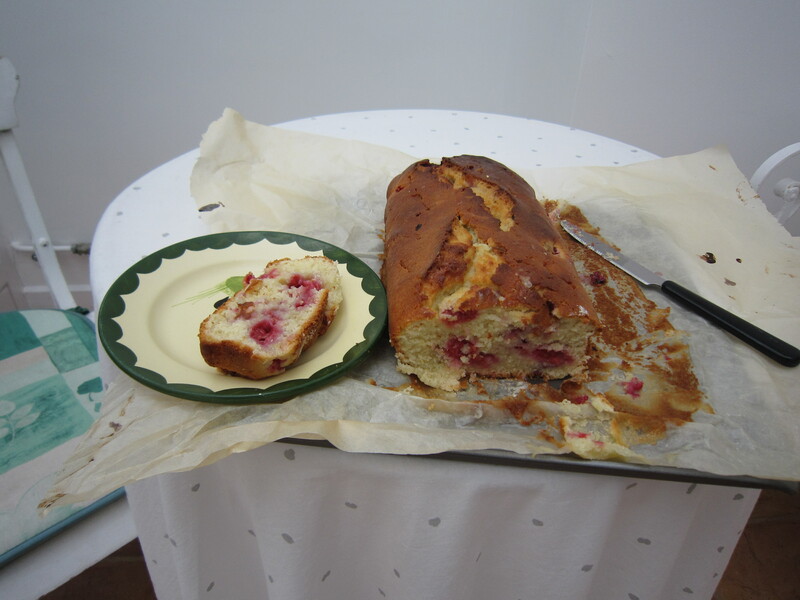 Getting through the leftovers is a challenge I’m usually up to. I'll be so sad when peach season is over. But in more exciting news, my house this year is throwing weekly brunches, which means I do get to do a little baking for fun (without the guilt that I will have to eat everything I make). I’ve been making these awesome muffins with apples for a while, whenever I want something around to snack on/have for an unhealthy breakfast. 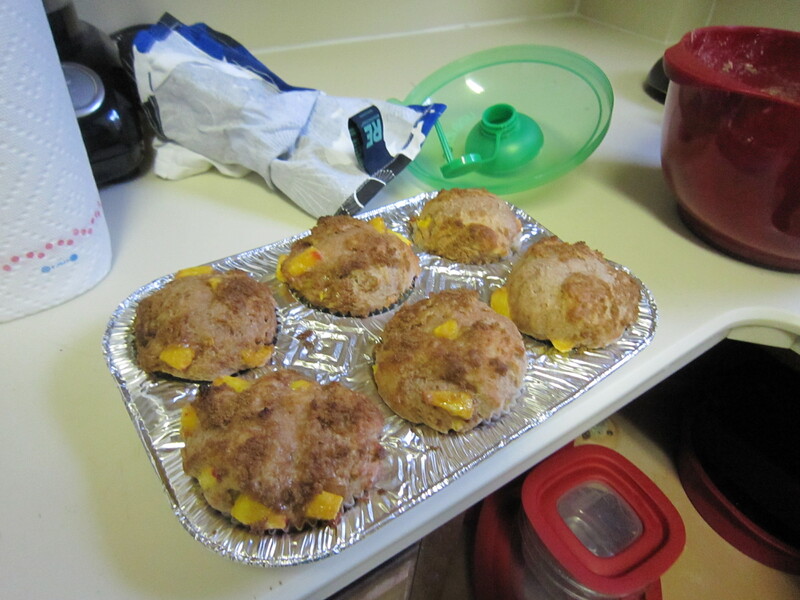 I made them with peaches this time, but I think I might prefer the apples cause they hold their texture better– or maybe I just didn’t have enough peaches. Whichever way you try them, don’t skimp on the brown sugar on top– it makes an awesome crust. Alice Waters’ Ratatouille— Take advantage of summer vegetables while they last! Delicious on cous cous with a fried egg on top. Lentils and Rice– On my meal plan for this week, a cheap and complete meal. Baba Ghanoush– Not technically a meal, but that is the beauty of only feeding yourself. 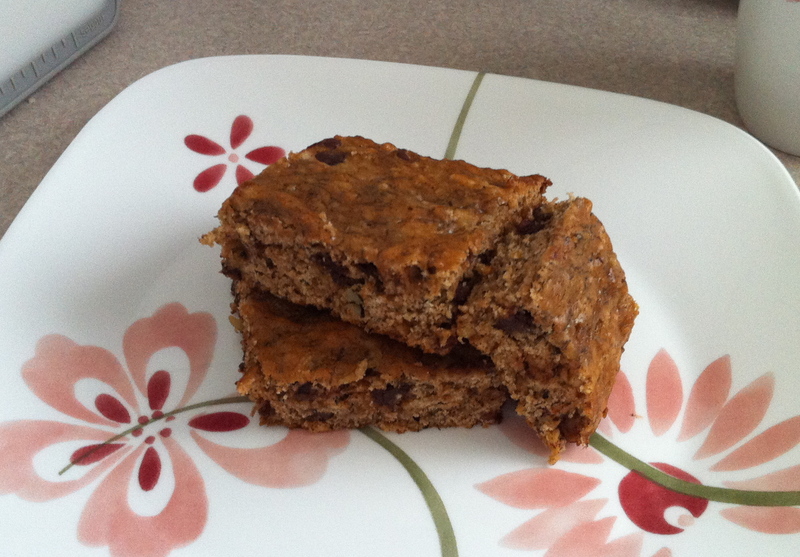 Baked oatmeal– I just made this for breakfast tomorrow. Hopefully a good way to prepare oatmeal ahead of time (without buying gross instant stuff). Method: Preheat the oven to 450F. Grease and flour, or line with muffin liners, a 12-18 cup muffin tin (yield varies depending on how much fruit there is/how much you fill the cups). 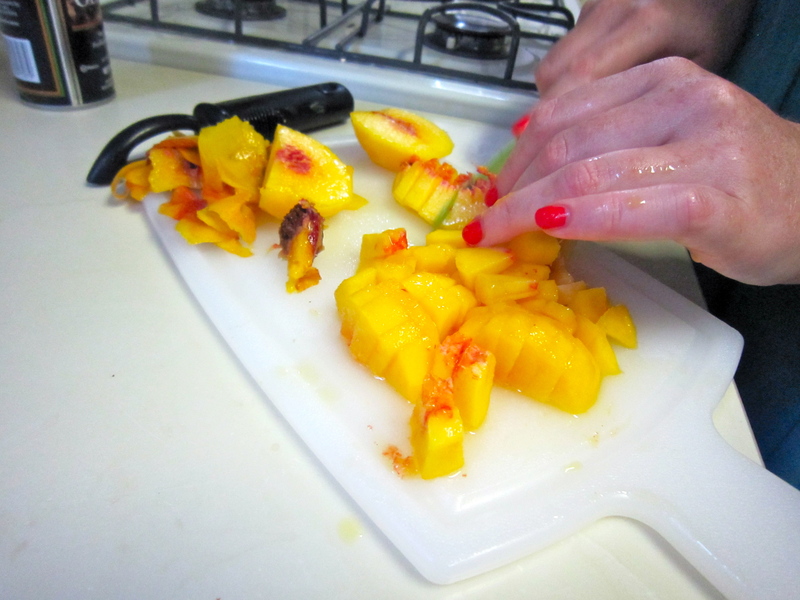 Peel the fruit and chop coarsely. Mix together the flours, baking soda, baking powder, salt, and cinnamon, and set aside. 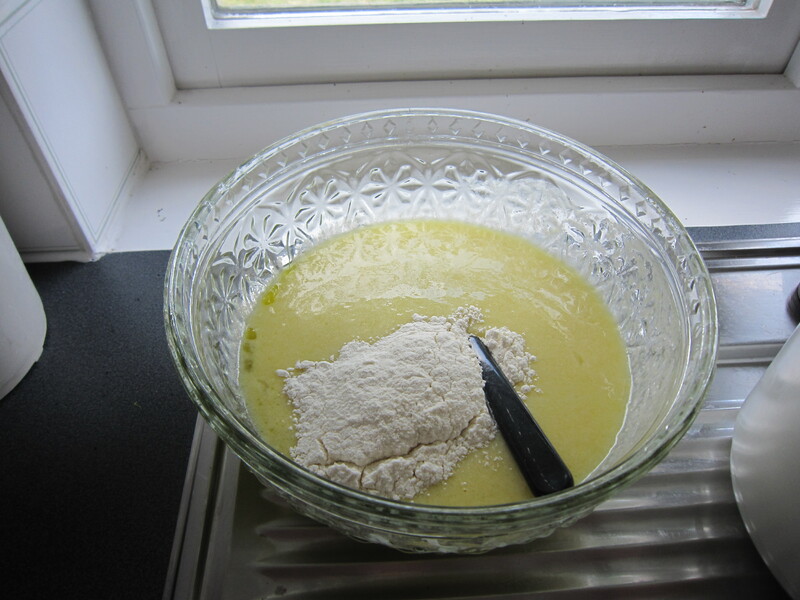 In a separate bowl, cream the butter with a hand mixer or a spoon and some elbow grease. Add the granulated sugar and only 1/4 cup of the brown sugar, and cream until fluffy. Lightly beat the egg, and add it to the sugar/butter mixture. Mix well, and then gently stir in the yogurt or buttermilk; over stirring may cause the mixture to curdle if using buttermilk. Stir in the dry ingredients and then fold in the fruit. Divide the batter among the muffin tins; you can fill them almost all the way. Sprinkle the remaining 1/4 cup brown sugar on top of the muffins, and bake for 10 minutes. Turn the heat down to 400F, and bake for an additional 5-10 minutes, until a tester comes out clean. Cool the muffins for five minutes in the tin, and then remove them to cool completely. Try not to only eat the tops. I have been seeing delicious corn recipes all over the place recently- charred corn salsa, corn tacos, grilled corn with feta, but yet when I impulsively bought two ears of corn at the farmers market I was at a loss for what to do with them. I decided to make risotto, and threw in some snow peas for good measure. The fresh corn goes well with creamy risotto, and both the corn and the snow peas add a crunch to the finished dish. In addition to the Parmesan that goes into pretty much any risotto, I crumbled feta in right at the end and sprinkled some on top of the risotto. 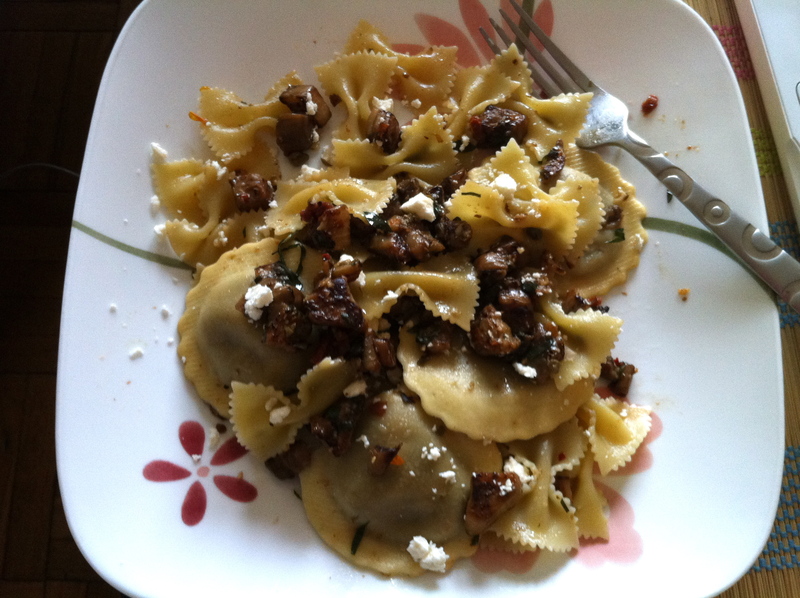 It was a delicious and filling summery dish, and (bonus!) 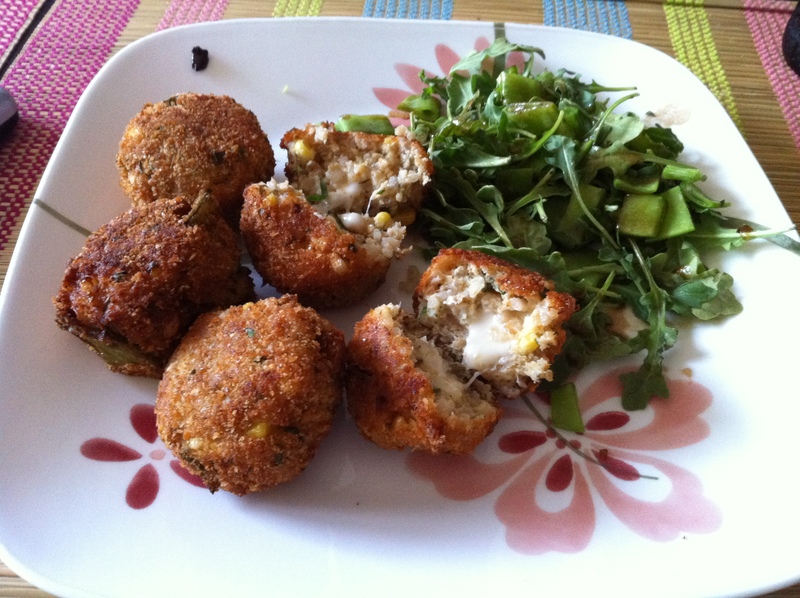 I was able to make fried and stuffed risotto balls with the copious leftovers. Since risotto is a dish that needs to be made in large amounts I am always able to make at least three meals out of a batch, but this time I decided to play around and make risotto balls stuffed with mozzarella and fried. The result was arguably even better than the risotto was when I first made it. The cold risotto is mixed with breadcrumbs, egg, and more herbs, then a cube of mozzarella or other melty cheese is placed in the middle of a golf-ball sized risotto ball, and they are rolled in more breadcrumbs and fried to golden brown perfection. These would make a great appetizer or starter at a party, but for me, several of them made an extremely satisfying dinner. After chopping the vegetables, bring the chicken stock and bay leaf to a simmer in a medium saucepan. In a large pan heat the olive oil over medium-high heat. Add the onions to the oil and sautee for 2-3 minutes, until softened. Next add the rice and cook until opaque, about 3 minutes. 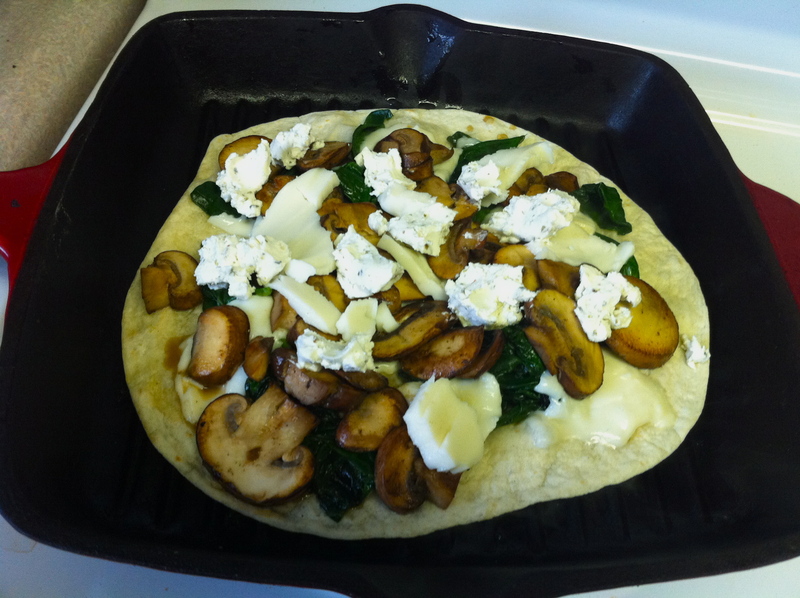 Add wine and cook until absorbed, another minute or so. Then begin adding the stock, 1 cup at a time. 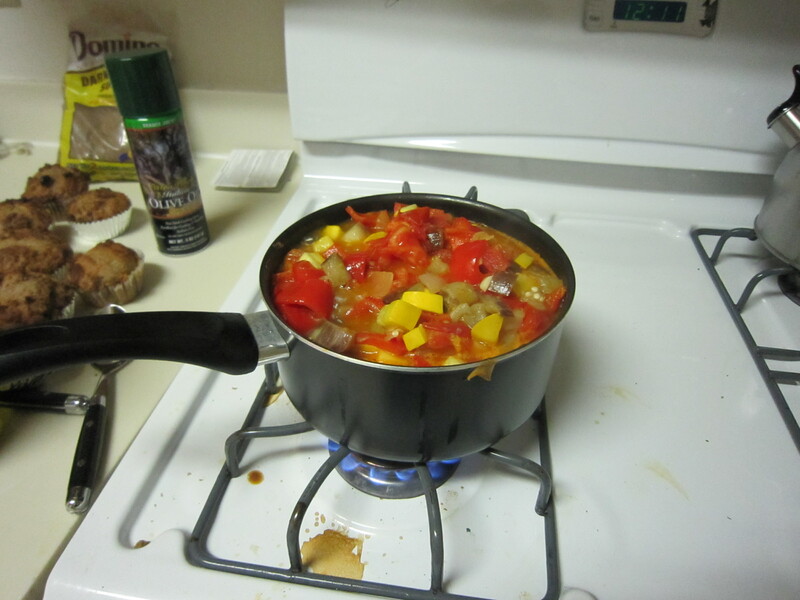 Add each cup of stock and cook over medium heat until absorbed, stirring frequently. When the stock is absorbed into the rice add the next cup, and continue until all of the stock is gone and risotto is cooked, about 25 minutes. Stir in the Parmesan, butter, basil, and season with salt and pepper to taste. 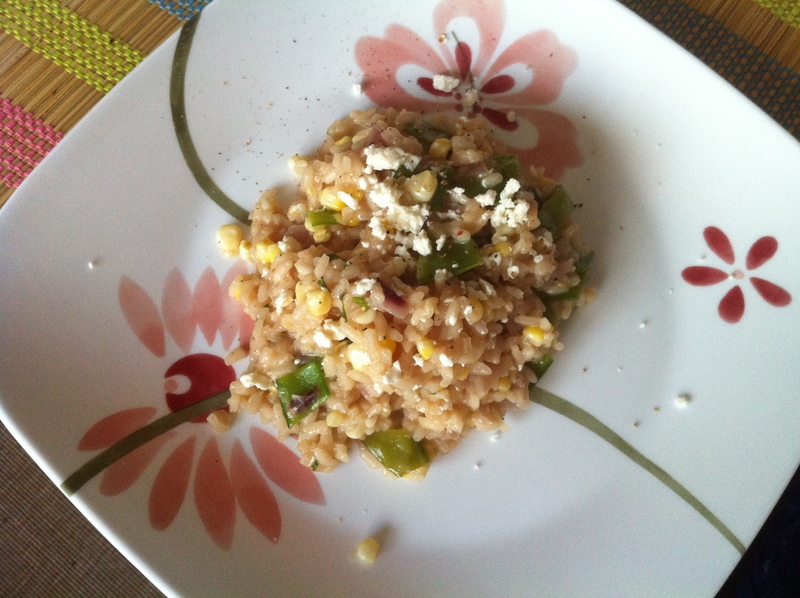 Crumble the feta into the risotto and mix in, then sprinkle plates with more feta if desired. Put 1 cup of breadcrumbs in a shallow dish. In a bowl combine 1/2 cup of the breadcrumbs, the risotto, Parmesan, basil, and eggs. Mix to combine, and then begin to form the balls. With damp hands take about 2 tablespoons of the risotto mixture and shape into golf-ball sized balls. Make an indent in the center of the risotto ball and add a cube of mozzarella, then cover the whole. Roll the risotto balls into the breadcrumbs to coat. In a large saucepan, add about an inch of vegetable oil. Heat over medium-high heat until about 350 degrees- to test without a thermometer fry a piece of bread in the oil, it should brown in about 2 minutes. In batches, fry the rice balls, turning occasionally, until golden brown- about 4-5 minutes. 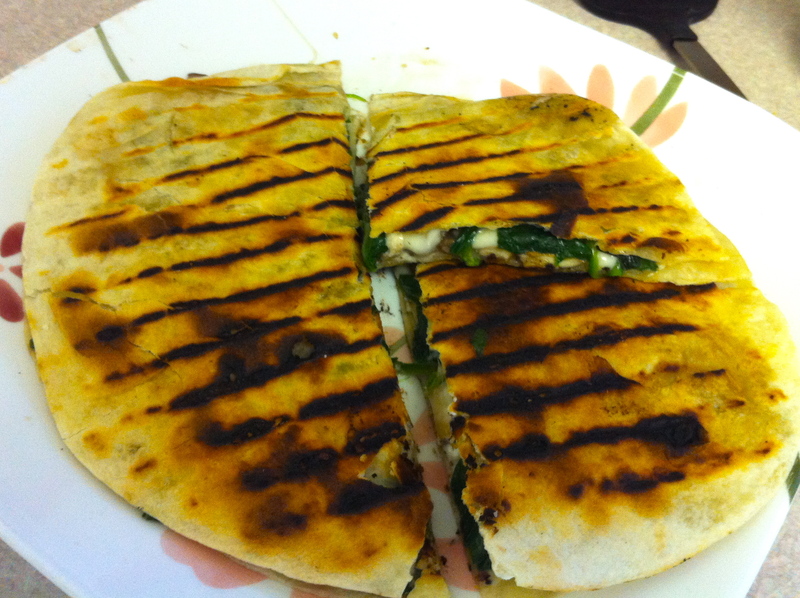 Take out of the oil and drain on paper towels before serving. Abandoned fruit... for the taking? eaten at all the in between places—restaurants in gas stations, which is apparently a big thing, and the little places scattered across the town I’m in. I’ve found that my most memorable meals have come at the extremes of the spectrum. 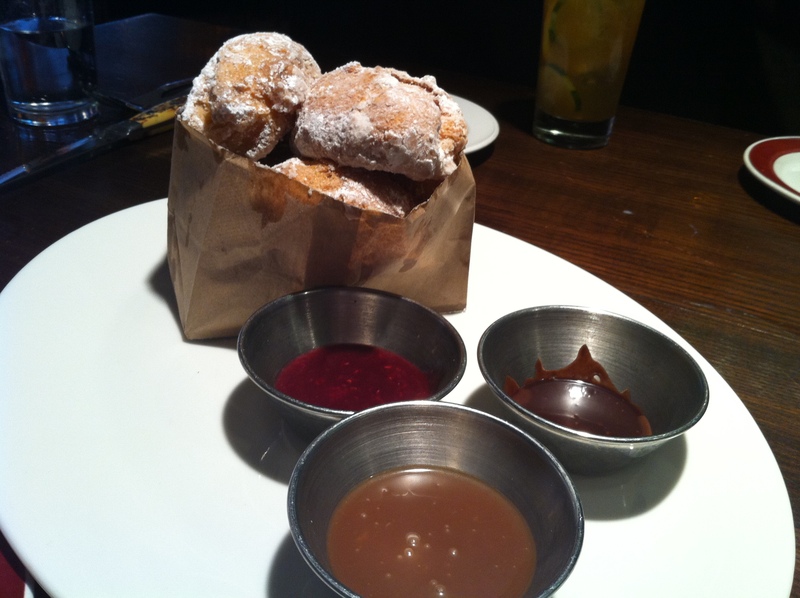 Donuts fried in front of you at a sweet stand, sprinkled with sugar and eaten standing up in a split second. Tables groaning under plate upon plate of different vegetables, and that’s just the first course. 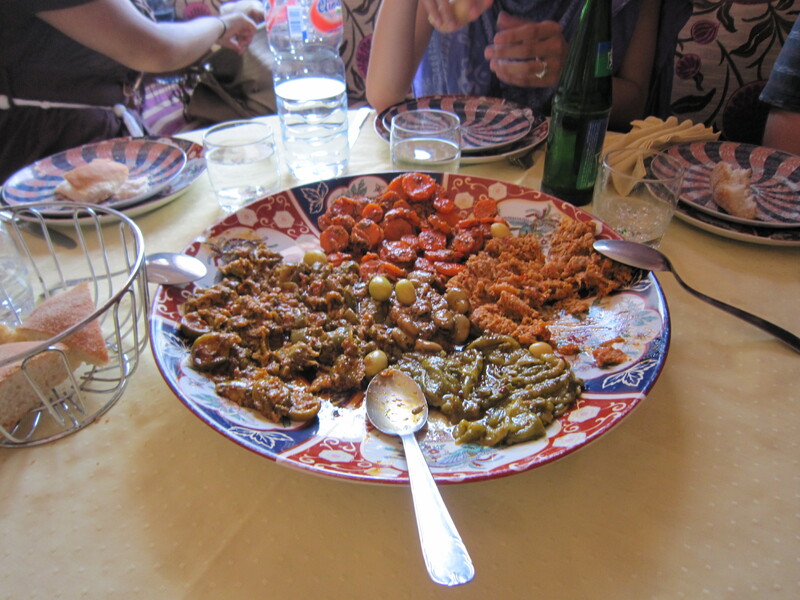 The stuff in between tends to blend together into one big tagine. That’s not to say that you can’t get great food at the mid-range restaurants, it’s just harder to tell if the lemon chicken tagine is going to be sublime or just mediocre. Unusually, these sweets were actually behind glass! paste. 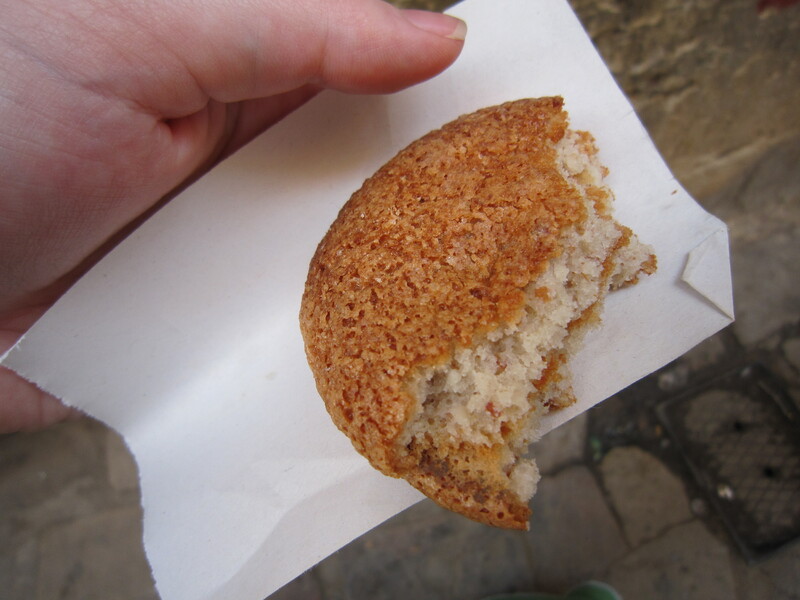 And while we’re on the topic of peanuts, one of my friends bought what she described as a “Moroccan whoopee pie” from a vendor in the Fez medina. It was two puffy almond-meal cakes sandwiched around a peanut butter filling—utterly delicious, and an excellent breakfast. Freshly squeezed orange juice also abounds in markets, but I was drawn instead to the tea stalls in Jma al Fna in Marrakesh. 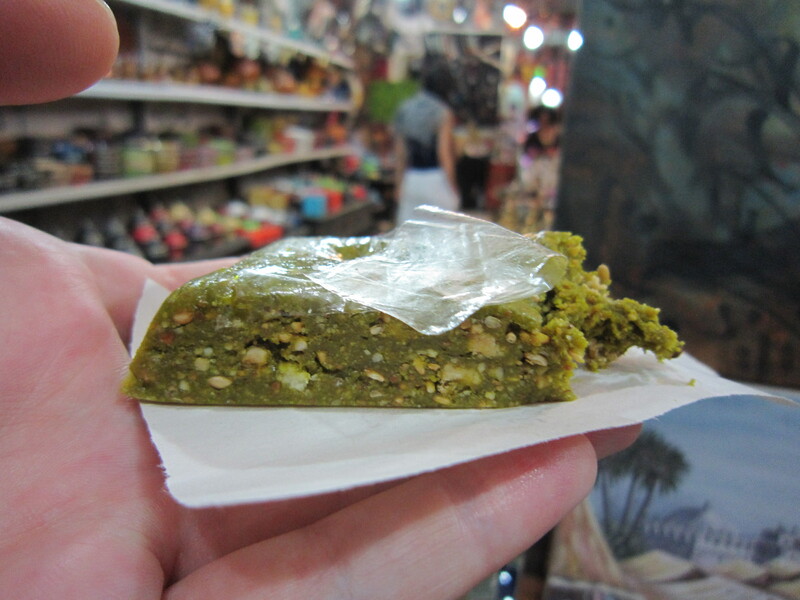 Instead of the ubiquitous Moroccan mint tea, this was a heavily spiced cinnamon—I had to buy some, it was so delicious. Everything you want American chai to be. 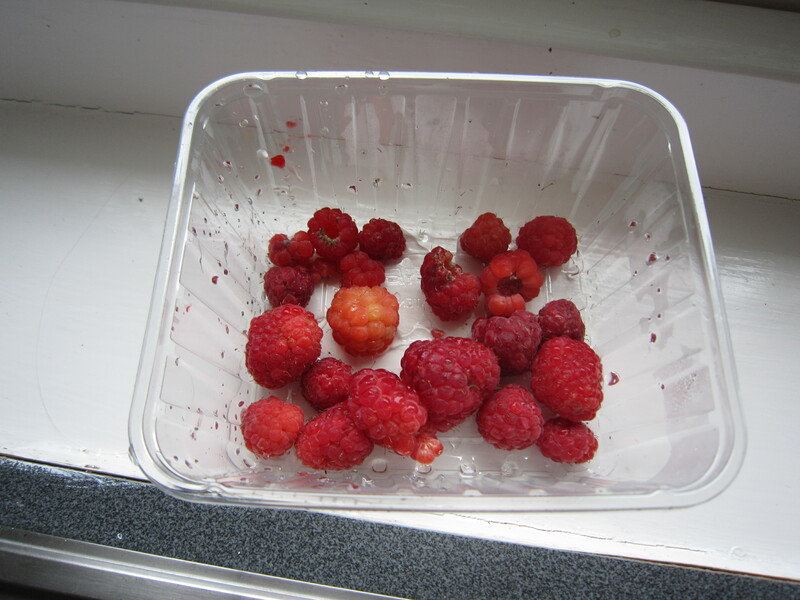 And I almost forgot all the fruit! Watermelon cut off the “tasting melon” at a souk and given to us for free with the toast “to your health.” Piles of dried dates and figs in every market you come across. Being forced to eat prickly pear after prickly pear from a cart before finally convincing the owner that we actually want to buy some to go. 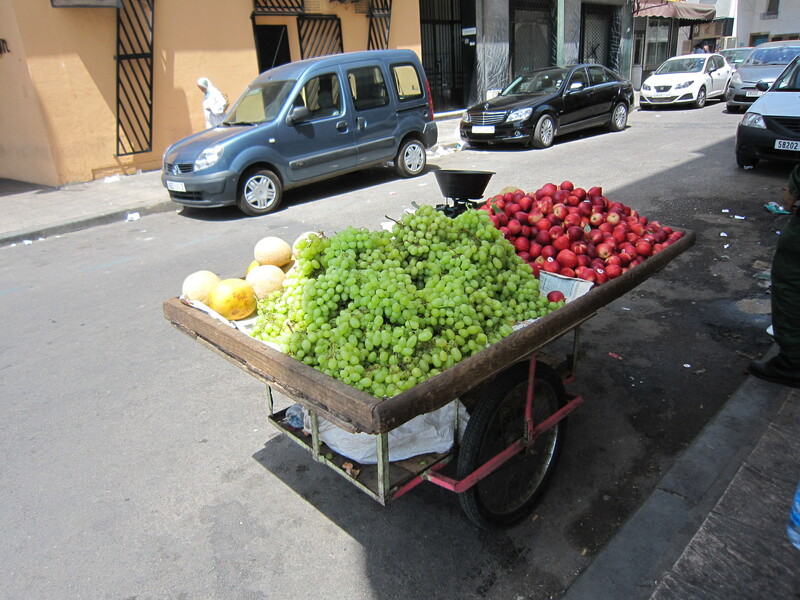 I may be lacking for fruit on campus, but there’s certainly tons to be found on the streets. 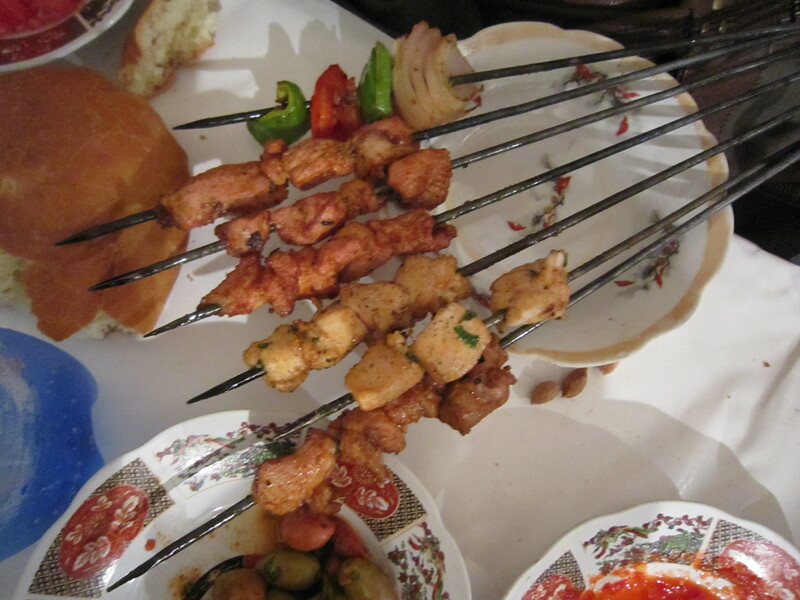 food—lots of skewers of meat, though the spicy red sauce we requested was an excellent accompaniment, and one of the few actually spicy things I’ve encountered in Morocco. The price tag, however, was close to those at upscale restaurants outside Marrakesh, a sad sign that Jma al Fna is more a tourist than local attraction at this point. Cheap food does abound, however. 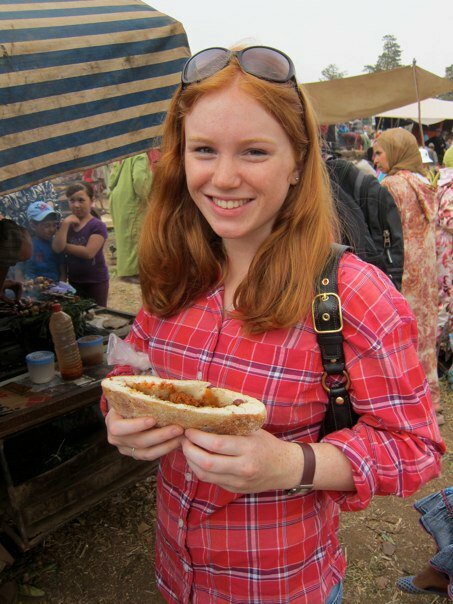 At a souk in Azrou a couple days later I finally tried a merguez sausage sandwich for about a buck—though tasty, I found the flavor a little too distinctive for my taste. Distinctive of what, I could not tell you… perhaps too lamb-y, it just wasn’t my favorite. The brochette (kebab) at the same stall were extremely fatty, salty, and delicious, however. I’m going to have to stop here because I am off tomorrow morning on my next culinary adventure, to an oasis in the Sahara. Who knows what they eat out there! So you will have to hold on just a little longer for tales of opulent lunches that left us practically comatose. This post is well past due, as Mexican food is one of my favorite cuisines (the margaritas may have something to do with this), and guacamole is my favorite Mexican condiment. I first made this for a barbecue a few weeks ago, and made it again for camping this past weekend. Although fresh guacamole really doesn’t keep more than 24 hours, it worked well for camping, as I made the pico de gallo and then brought the whole avocados, so all we had to do campfire-side was cut and mash up the avocados and mix the whole thing together. Some of our group was napping in our tent during the guacamole making/eating, and we only very half-hardheartedly yelled down the path to tell them about it. Hey, no one wants to share guacamole. It’s not like they starved, I promise- camping meals included lamb burgers, greek salad, bbq chicken, spicy sausages, and chocolate chip/walnut/raisin cookies. Clearly we don’t mess around when it comes to food, even if it does have to be cooked over a fire. To make the pico and guac, you just have to chop up some vegetables and herbs, season with lime and salt, and mash with very ripe avocados. Although I am sometimes weary of lots of heat, the jalapenos do add a great extra kick to the pico, and they don’t make it overly spicy at all, especially if you take out most of the membrane and seeds. The most important thing for both of these is to taste and adjust the seasonings at least once- our resident Cali-girl Alicia was an expert at getting the perfect lime to salt to avocado ratio, and you can be too as long as you keep adjusting the flavor until you have perfect guacamole. Just be careful not to set the plate down unattended, this stuff goes pretty fast. Chop up all the ingredients and add to a medium sized bowl. 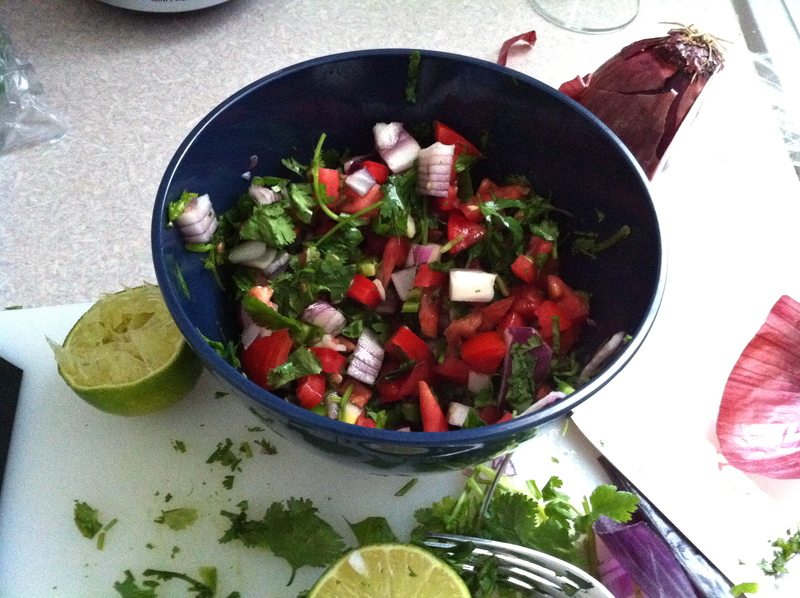 Use less cilantro if you want, just discard the stems and chop up the leaves roughly. Mix together, add lime juice and salt to taste. Pico will keep in the fridge for a few days. Cut the avocados in half lengthwise, and take out the pit (I use a knife to stab it and rotate, but assume no responsibility if someone chops off their hand with this method). Scoop out all of the avocado flesh using a spoon, and place all of the avocados on a plate. Mash with a fork, but leave chunky. 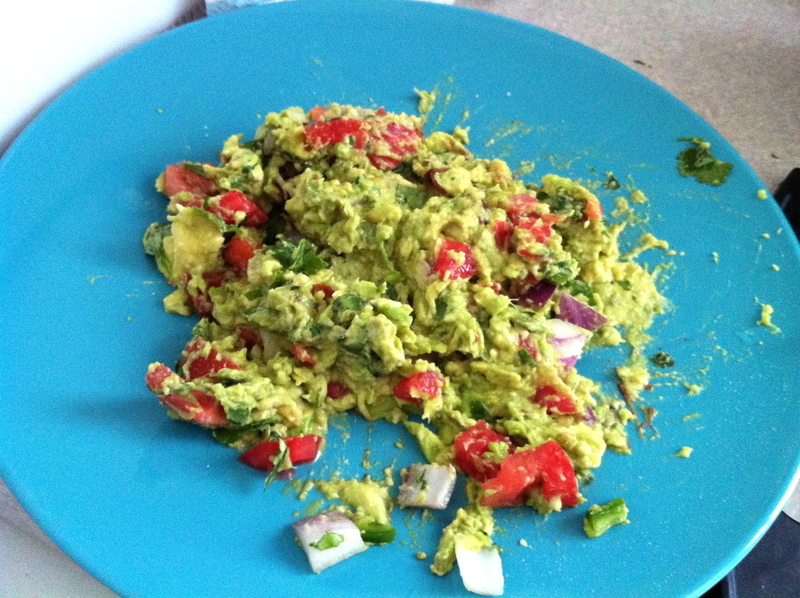 Add a pile of pico de gallo to the avocados and mix together. Season with lime and salt to taste, and add more pico if desired. Keeps 24 hours, covered with clingfilm in the fridge. Somehow I blinked and I have been in Morocco for a little over a week already! I am studying abroad here for four weeks, and will hopefully be writing a few posts about the (so far delicious) food I encounter. My program is based at a university in a small town in the Atlas mountains. We have a generous meal plan, but unfortunately the food is pretty bad, which probably makes everything I taste outside the walls seem infinitely better. Thankfully, we have a lot of trips built into our schedule (and the program gives us a food budget for them! 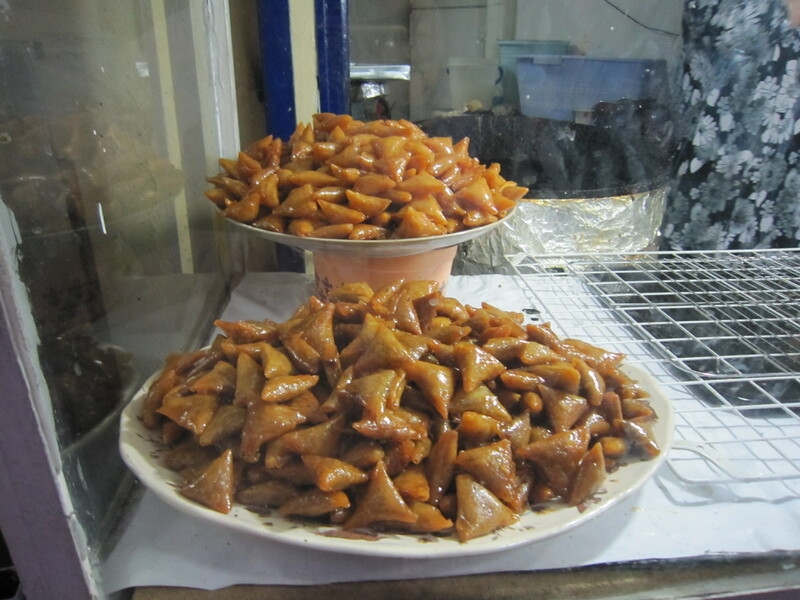 ), so I have already been able to try quite a few Moroccan specialties. 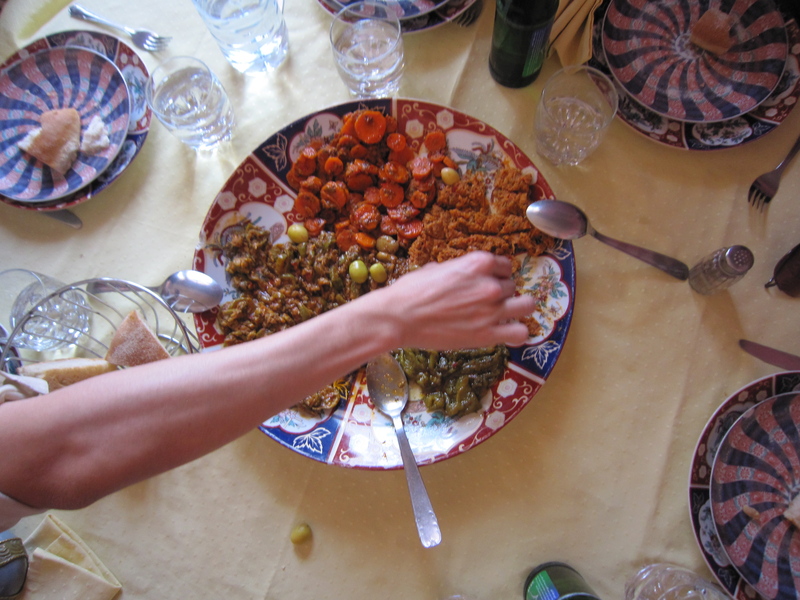 The first thing I wanted to try, of course, was a tagine– the ubiquitous stew-like dish named after the clay pot in which they are cooked. (I bought a tagine for about 2.50 yesterday, and am excited to try cooking with it, if it makes it back to the States in one piece!) 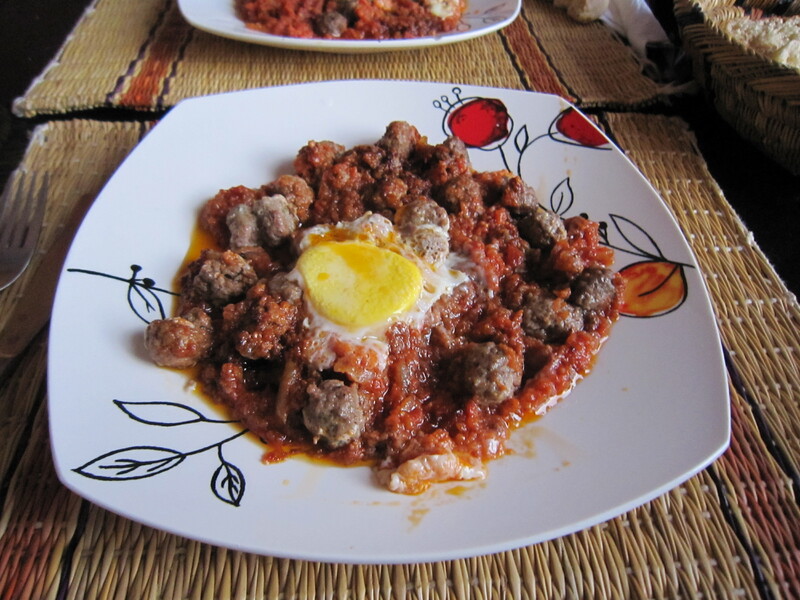 One of the most common tagines is kefta, which is usually beef (I believe) meatballs in a tomato sauce, with an egg on top. Though delicious, this seemed pretty similar to something I could get back in the US to me, and I probably won’t order it too often if there’s something more interesting on the menu. 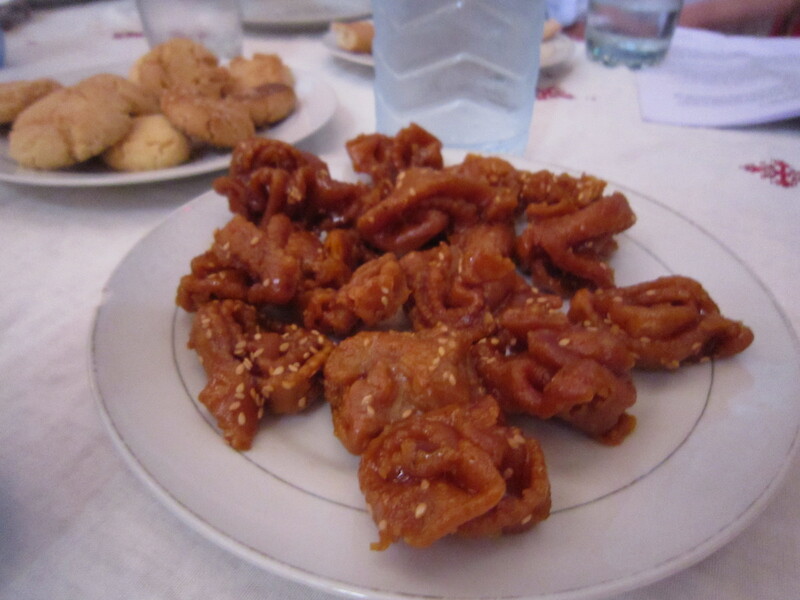 There definitely were lots of interesting things at the first proper restaurant I went to, Dar Naji in Rabat. We arrived in Rabat pretty late after a 3 hour bus ride, and our professor pretty much just ordered the entire menu for our group of ten. This was excellent for my food-reporting, as I got to try just about everything, and discovered what I will definitely order again. 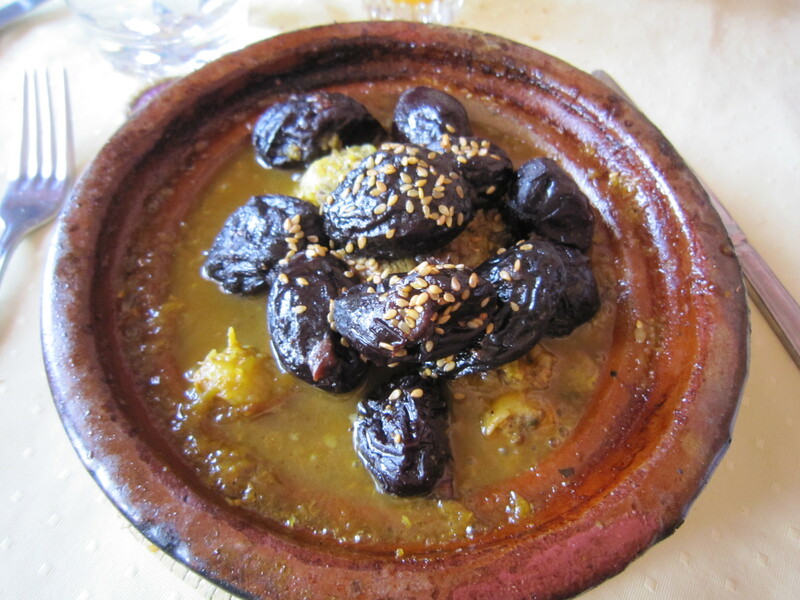 Someone else in the group also noticed that brain tagine was on the menu, and requested that we order one to give it a shot. Not being one to pass up a new food experience, I tried it as well. 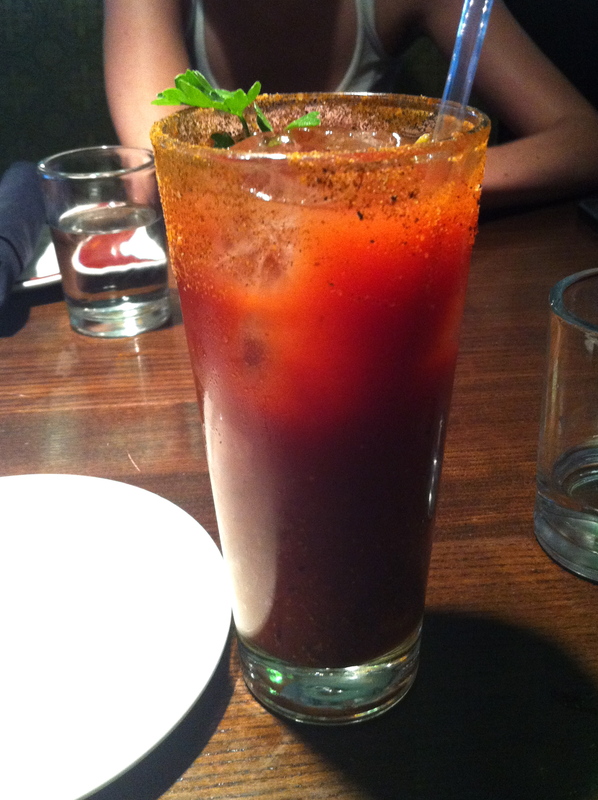 The brain was in a tomato-y sauce, and I really didn’t think it had a strong flavor in itself. 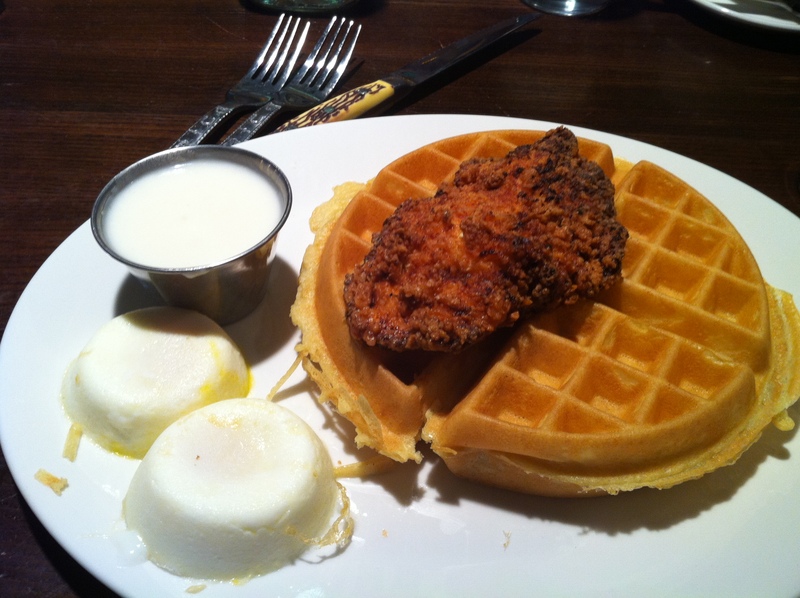 The texture reminded me of scrambled eggs– not at all off-putting, but I wouldn’t feel the need to order it again. 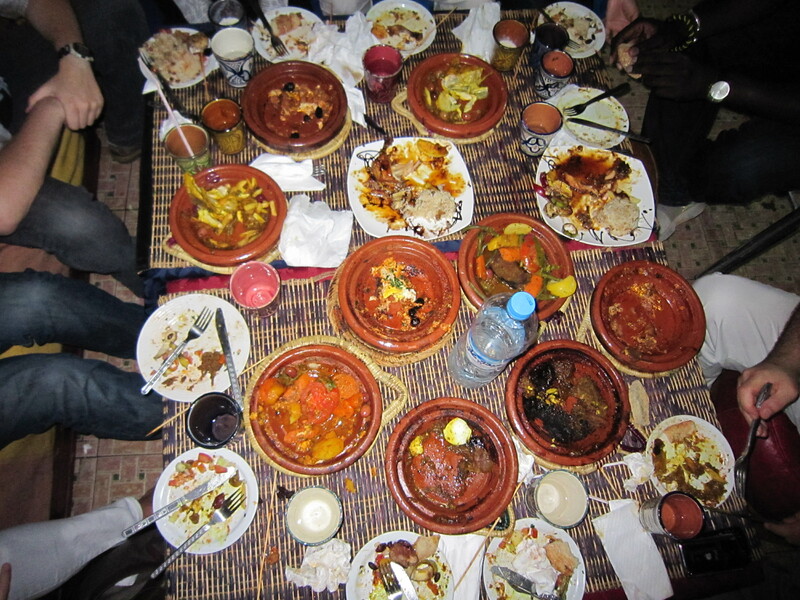 The other tagines included chicken with lemon, beef with vegetables, fish, and kefta. I loved the lemon sauce with the chicken, but found the meat itself a bit dry… I think my next tagine will have to be chicken so I can see if this is a common problem. The setting of Dar Naji was also beautiful… we were seated at a low table on the terrace, which had a canopy covering and overlooked the medina (old city) walls. 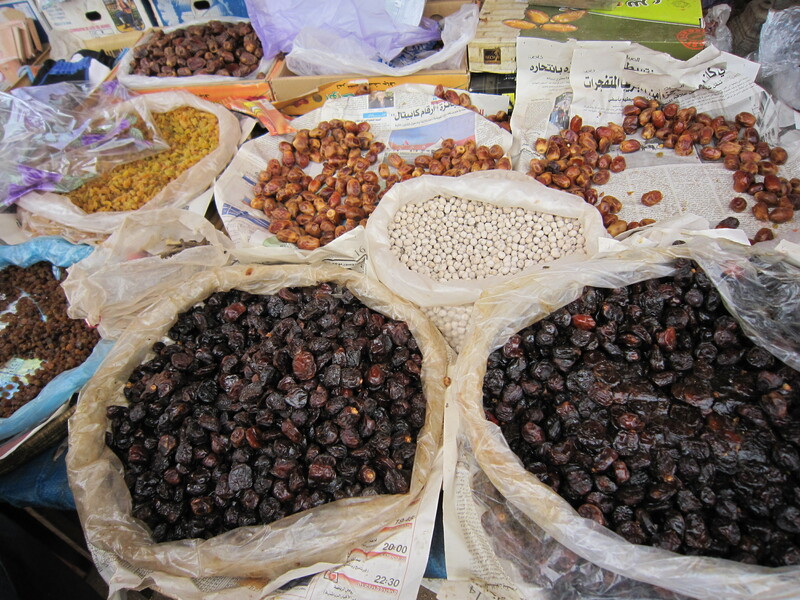 And it was all reasonably priced, at about $5 per tagine. serving plate straight to mouth. The vegetable were all cooked in various spiced sauces, and served cold. The green marinated peppers were probably my favorite, though the carrots were also unexpectedly sweet and delicious. 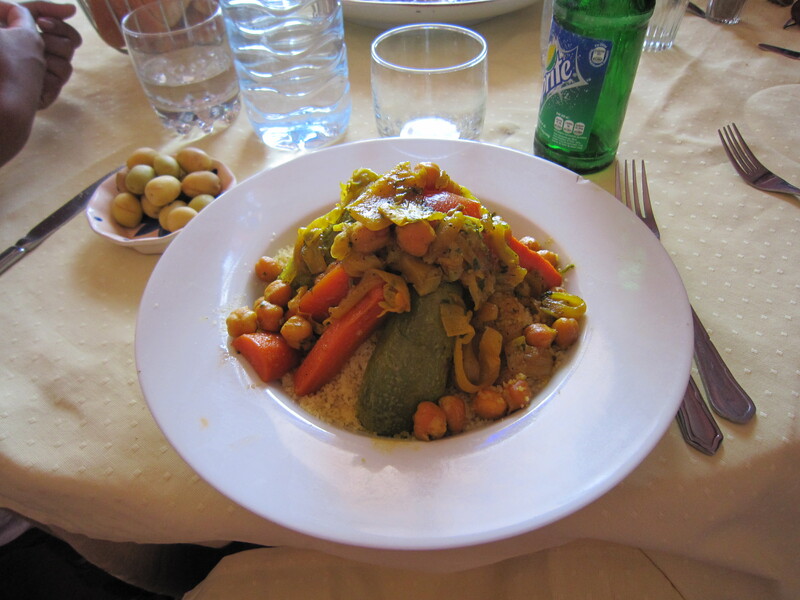 I ordered cous cous as a main course, which is another Moroccan specialty usually served on special occassions, and though it usually comes with meat I requested it be left off because I just didn’t feel the need for it. The resulting tower of cous cous covered in vegetables was excellent. The vegetables had some sort of sauce on it that tasted faintly buttery, but I couldn’t really pin down what was in it. But it seeped down into the cous cous and made a delicious dish that was perfect for lunch, not nearly as heavy as a tagine. I have so much more I could say but I think I will leave it there in order to save some things for another post! Bislaama.